Mark Twain (1835-1910), born Samuel Clemens, was a uniquely American individual. He was born in the Midwest to an impoverished and somewhat troubled family, and he reveled in small town life along the Mississippi River. He was on the way to becoming a steamboat conductor as a young man until this path was interrupted by the the Civil War. He then moved west to become an unsuccessful prospector and miner, where Twain found he had a knack for storytelling and keeping all kinds of company. And he soon discovered he also had a knack for writing. From journalism (much of his early material reminiscent of our current The Onion), to travel writing, he established himself not only as an author but a performer. He then moved to the East Coast and quickly become a well-known writer. Twain’s work began to reward him well, he married well, and he and his new wife established a high-style residence for themselves in Hartford, Ct. that is now a museum. 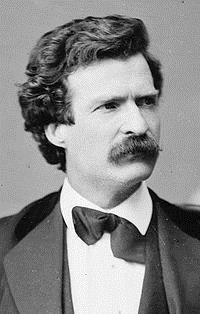 Twain and managed to assume both distinctive American identities – frontier populist and Eastern gentleman. It was during their time there that Mark Twain wrote his best-known books that have become classics of American Literature: Life Along the Mississippi, The Adventures of Tom Sawyer, The Adventures of Huckleberry Finn, and A Connecticut Yankee in King Arthur’s Court. Troubles lay ahead. Nearing bankruptcy due to terrible investments and poor money management Twain spent nine years touring the world giving performances of his work. His favorite daughter died during this time and he slipped into a depression. He returned to America to a hero’s welcome and became a media celebrity at the beginning of the age of mass media. At this time he adopted his famous white suit that became his media image. He used his cultural importance to advocate for causes that were important to him, such as the rise of the Ku Klux Klan and the poor treatment of American’s black population and America’s imperial ambitions. His trip around the world had sensitized him to the damage being down around the world by the European powers. Burdened by the death of his wife and another daughter, Twain’s last years were lonely but productive. At the time of his death he was one of the world’s best known Americans. When I was growing up Mark Twain and his work were very well-known and part of the English curriculum of most school systems in the United States. I remember from the late 1960’s seeing Hal Holbrook’s one-man performance of Mark Twain Tonight, for which he won an Emmy Award for the TV production and a Tony Award for the Broadway production. I fear that Twain is not as well-known today, although modern political humorists (particularly Jon Stewart) owe much to him. From his Autobiography: “Suppose you were an idiot. And suppose you were a member of Congress. But I repeat myself.” With his media savvy and from the issues that were important to him, he would fit right in today. In many ways Twain has become a prophetic figure for the American century after his death. 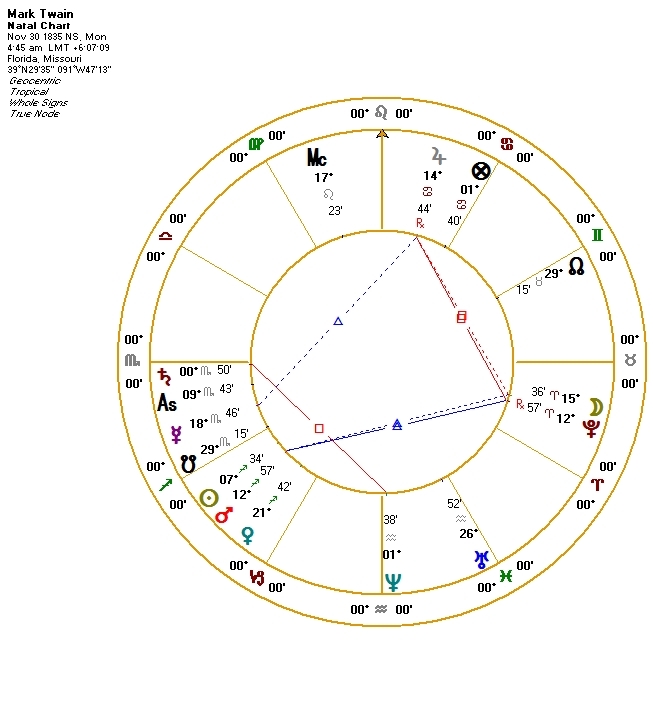 Twain’s natal chart is to the left (click the image to display a larger view in a new window). As usual, I begin with the Ascendant, planets within the First House, and the ruler of the sign of the Ascendant. Here we find one perspective on Twain: cool-minded, disciplined, and very perceptive. Saturn in Scorpio occupying the First House makes for a reserve and an ability to put oneself forward in a very deliberate way. When he achieved wealth in his middle age, he became a prosperous New England Yankee during a cultural era you would call Victorian. He managed it well, at least the social part of it. These positions have had a strong effect on his brand of humor. For example, “It is better to keep your mouth closed and let people think you are a fool than to open it and remove all doubt.” And a personal favorite: “Do the right thing. It will gratify some people and astonish the rest.” His strong Scorpio First House is glowing. According to the traditional doctrine of Planetary Joys, Mercury is in its Joy in the First House. Mercury gives cleverness and calculating shrewdness to the personality when in the First. Twain’s Mercury is swift-moving and oriental to the Sun, although in an evening chart Mercury would be out of sect following the Sun. Mercury’s swiftness and orientality increase its influence in this chart. Mercury is out of sect and in Scorpio may give him strong powers of attention and concentration – and he does not say all that is on his mind. There is a lot in his mind! Mercury’s presence is strengthened further by its trine to Jupiter that is exalted in Cancer – and in the same sign as his Lot of Fortune. 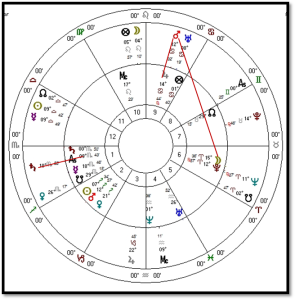 Twain’s Jupiter merits its own discussion; in connection to Mercury, Jupiter adds a humanitarian and caring streak to his otherwise calculating and ambitious nature. Twain’s chart is full of contrast. We encounter the element fire with Twain’s Sun and Moon, Venus and Mars. This contrasts mightily with his Scorpio Ascendant and the planets in the First House – fire is enterprising, ambitious, imaginative, and irrepressible, unlike Scorpio’s famous reserve. Twain’s Moon is conjunct Pluto, depicting somebody with eyes wide open to the seamier side of things around him, from his youthful encounters with slavery, the scandal-ridden culture of the “wild west”, to the inequalities of the post-Civil War “gilded age” (a term he seems to have invented). Moon in Aries will try new things – not always with happy results — and Twain could adapt to many different environments when he wanted to. Twain‘s planets in Sagittarius conform nicely to the usual depictions of this sign as personally buoyant and adventurous but also oriented to the larger picture. Let’s focus on Jupiter exalted in Cancer in a “feminine” sign. This is different from the more “masculine” Jupiter that is more like the sign Sagittarius. Cancer adds a personal side to Jupiter’s humanitarian nature that culminated in some passages from his classic Huckleberry Finn – how does the title character reconcile breaking the law (and his society’s concept of morality) with his personal regard for his escaped slave friend Jim? In the end, the character says, “maybe I’ll go to Hell, okay”. This passage may be the best depiction of a feminine Jupiter we can find. In spite of his position of privilege Twain advocated the humane treatment of immigrants, sympathy for the rising labor movement, and later in life he expressed regret at the damage done to Native American culture as a result of American westward expansion. 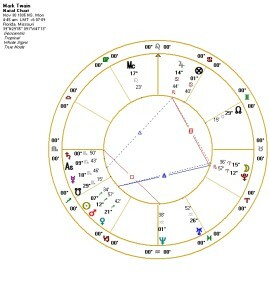 Jupiter is the dispositor (although not well connected) to Twain’s Sagittarius planets; the governing planet of his First House Scorpio is Mars in Sagittarius. Jupiter has aspects to both Moon and Mercury. Twain’s Lot of Fortune is with Jupiter in Cancer. The Lot of Courage, the Hellenistic Lot associated with Jupiter that relates the great benefic to the Lot of Spirit, is close by Twain’s Lot of Fortune. In addition, Twain’s Lot of Spirit is itself in Pisces and is governed by Jupiter. Jupiter’s masculine side does present itself in his three planets in Sagittarius, but Jupiter itself, in its exaltation in a feminine sign, combines being an opinion leader with a strong sense of a human suffering and possibility. There are other chart factors of importance. Those astrologers who work with the “minor aspects” would note the quintile relationship between Twain’s Mercury and Pluto, both of which square Saturn in his Fifth Harmonic chart. This reinforces the insightful and creative qualities of Twain’s Mercury but also its discipline. Those who use fixed stars for information about Twain’s character and his prominence in life have much to work with: Sun is conjunct the fixed star Antares (the Heart of the Scorpion), and there are also important co-risings or paranetelle: Fomalhaut (another “royal star”) rises with the Moon and Arcturus rises as the Moon sets; Twain’s Sun sets as both Sirius and Bellatrix rise. For somebody with reserved Scorpio rising, Twain had quite the solar presentation, white suit or not. There are many important events in Twain’s life and his life is well-documented. I will close by focusing on one important turning point in his life: his first public performance reading his own work. Twain had turned thirty the year before and had gone to Hawaii as a travel journalist coming back with writings about its beautiful and exotic culture. In early October 1866 Twain decided to present his work as a public event, charged a half dollar for admission, and to Twain’s surprise and gratification it was a major success. This event was important for several reasons. Performing his work became a source of income and sent him around the world later in life when he desperately needed the cash. It also helped Twain’s development as a writer – he tailored his writing style to his work being read aloud. This was important to being a popular writer in 19th century American where often only one member of a household could read. Here’s the bi-wheel (again, click the chart to display a larger view in a new window) with Twain’s natal chart on the inside and early October 1866 on the outside. In the previous few years “roughing it” in the West Twain had important progressions: Pluto going direct, Moon square Sun, and progressed Mercury into Capricorn. By transits Twain’s Saturn return was the previous year. 1866 was a year for his first journalistic enterprises, when he left rural Nevada for more urban San Francisco, began to use “Mark Twain” as his writing name, and found a writing style that mixed information with deadpan humor. Twain launched his performance career with transiting Saturn on the Ascendant! It was a move he took deliberately, approaching it in an analytic professional way. He was extremely nervous before the performance, and this was quite unusual for him. He also learned about new possibilities for himself – if he worked at it intensely. Noteworthy also are the movements of transiting Mars that would embolden him to take his “act” onto a larger stage in front of a notoriously tough crowd of male laborers, miners, and dock workers. 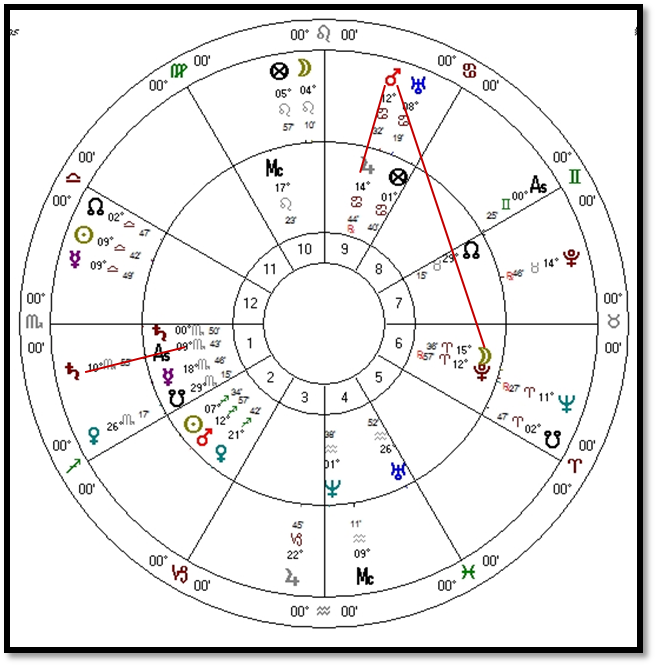 Transiting Mars is in Cancer, close to a conjunction with his all-important Jupiter, in exact square to Pluto and approaching a square to Moon. Together with his careful Saturn deliberateness and planning, it appears that Twain’s act was also a moment of personal chutzpah that would in the long term pay off enormously well for him. Happily the crowd loved it and a stage star as well as a great writer was born.